Just wanted to give you an update on the huge Indiegogo Fundraiser I'm doing trying to raise money to fly to Japan. I added last week the Q&A post to answer some questions I got the first couple of weeks.. Yesterday I added a couple of perks that were long requested. There has been interest in official Sasuke merchandise that is extremely difficult to get outside of Japan. I added 2 different perks. One perk is for the Tee-shirts and one perk is for the Towels. Only during the taping of Sasuke do these things become available. 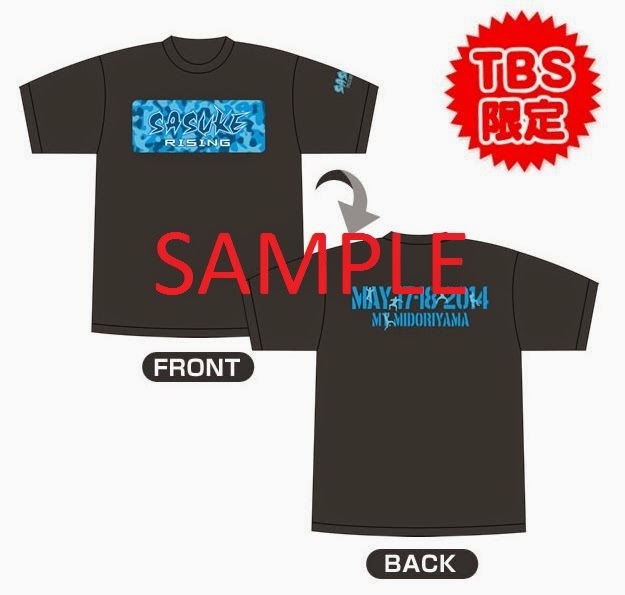 As sampled above, TBS prints limited edition Sasuke tournament shirts with the date and year on them. For a $100 donation I can buy a Shirt or a Towel for you. Please remember that I have to buy them at full price and are subject to availability during the taping of the tournament. This is why I'm limiting the amount I would buy at Sasuke. Don't forget to add the shipping costs (domestic or international). I'd have to get there early before they sell out so I'm trying to be careful how many I can get the first day of the tournament. The event itself tapes over 2 days but they don't have their merchandise stall open on the second day. The merchandise available varies but the two constants are the shirts and the towels. Also, if f there is any interest in importing the 2014 versions (that are only made available through online sale ONLY within Japan), I can arrange a $100 perk just for that. I can arrange with friends for them to be ordered within Japan. The way it will work is that I will make a bulk order for them (full price of course), pick them up when I'm in Japan and then mail that set to you when I get back home. Please send me a message if you are interested. Because it will also require the help of a second party and I'd have to pay for shipping within Japan, the price will be the same as the 2015 set. I will only do this during the Indigogo Campaign which is up for another 3 weeks to help get some of the money to reach the goal. As always I'll always update on both the Indiegogo site and on the initial post. I'll expand on them if there's interest and will do what I can to get more of them. Everybody should like the T-SHIRTS I know I do. Good luck, Arsenette! 18 days left, and you've only raised almost half. The T-Shirts and towels, for one thing I'd love to have them! I saw a video of sonebody opening up official SASUKE RISING T-Shirts and Towels. Dang, I wish I was in his shoes!